31 F None No Power Seat 31 F is a standard Economy Class seat, however this seat may have restricted legroom due to the position of the bulkhead. 31 G None No Power Seat 31 G is a standard Economy Class seat, however this seat may have restricted legroom due to the position of the bulkhead. 32 A None No Power Seat 32 A has extra legroom due to the missing seat in front. 32 C None No Power Seat 32 C has extra legroom due to the missing seat in front. 32 D None No Power Seat 32 D has extra legroom due to the missing seat in front. 32 H None No Power Seat 32 H has extra legroom due to the missing seat in front. 32 J None No Power Seat 32 J has extra legroom due to the missing seat in front. 32 L None No Power Seat 32 L has extra legroom due to the missing seat in front. 42 H None No Power Seat 42 H is a standard Economy Class seat, however other flyers tend to bump into this seat. 43 A None No Power Seat 43 A is a standard Economy Class seat, however, this seat may have limited recline and the proximity to the lavatories may be bothersome. 43 C None No Power Seat 43 C is a standard Economy Class seat, however, this seat may have limited recline and the proximity to the lavatories may be bothersome. 43 D None No Power Seat 43 D is a standard Economy Class seat, however, this seat may have limited recline and the proximity to the lavatories may be bothersome. 43 F None No Power Seat 43 F is a standard Economy Class seat, however, this seat may have limited recline and the proximity to the lavatories may be bothersome. 43 G None No Power Seat 43 G is a standard Economy Class seat, however, this seat may have limited recline and the proximity to the lavatories may be bothersome. 43 J None No Power Seat 43 J is a standard Economy Class seat, however, this seat may have limited recline and the proximity to the lavatories may be bothersome. 43 L None No Power Seat 43 L is a standard Economy Class seat, however, this seat may have limited recline and the proximity to the lavatories may be bothersome. 61 A None No Power Seat 61 A may have extra legroom due to the position of the bulkhead, however the proximity to the lavatories may be bothersome. 61 C None No Power Seat 61 C may have extra legroom due to the position of the bulkhead, however the proximity to the lavatories may be bothersome. 61 D None No Power Seat 61 D may have extra legroom due to the position of the bulkhead, however the proximity to the lavatories may be bothersome. 61 F None No Power Seat 61 F may have extra legroom due to the position of the bulkhead, however the proximity to the lavatories may be bothersome. 61 G None No Power Seat 61 G may have extra legroom due to the position of the bulkhead, however the proximity to the lavatories may be bothersome. 61 H None No Power Seat 61 H may have extra legroom due to the position of the bulkhead, however the proximity to the lavatories may be bothersome. 61 J None No Power Seat 61 J may have extra legroom due to the position of the bulkhead, however the proximity to the lavatories may be bothersome. 61 L None No Power Seat 61 L may have extra legroom due to the position of the bulkhead, however the proximity to the lavatories may be bothersome. 70 D None No Power Seat 70 D is a standard Economy Class seat, however other flyers tend to bump into this seat. 70 H None No Power Seat 70 H is a standard Economy Class seat, however other flyers tend to bump into this seat. 71 D None No Power Seat 71 D is a standard Economy Class seat, however this seat may have restricted legroom due to it being misaligned with the row in front. 71 F None No Power Seat 71 F is a standard Economy Class seat, however this seat may have restricted legroom due to it being misaligned with the row in front. 71 H None No Power Seat 71 H is a standard Economy Class seat, however this seat may have restricted legroom due to it being misaligned with the row in front. 74 D None No Power Seat 74 D is a standard Economy Class seat, however the proximity to the lavatories may be bothersome. 74 H None No Power Seat 74 H is a standard Economy Class seat, however the proximity to the lavatories may be bothersome. 75 D None No Power Seat 75 D has limited recline and the proximity to the lavatories and galleys may be bothersome. 75 F None No Power Seat 75 F has limited recline and the proximity to the lavatories and galleys may be bothersome. 75 H None No Power Seat 75 H has limited recline and the proximity to the lavatories and galleys may be bothersome. 8 A None No Power Seat 8 A is a standard Business Class seat, however the proximity to the galleys may be bothersome. 8 C None No Power Seat 8 C is a standard Business Class seat, however the proximity to the galleys may be bothersome. 8 D None No Power Seat 8 D is a standard Business Class seat, however the proximity to the galleys may be bothersome. 8 H None No Power Seat 8 H is a standard Business Class seat, however the proximity to the lavatory and galleys may be bothersome. 8 J None No Power Seat 8 J is a standard Business Class seat, however the proximity to the lavatory and galleys may be bothersome. 8 L None No Power Seat 8 L is a standard Business Class seat, however the proximity to the lavatory and galleys may be bothersome. 9 H None No Power Seat 9 H is a standard Business Class seat, however the proximity to the lavatory and galleys may be bothersome. 9 J None No Power Seat 9 J is a standard Business Class seat, however the proximity to the lavatory and galleys may be bothersome. 9 L None No Power Seat 9 L is a standard Business Class seat, however the proximity to the lavatory and galleys may be bothersome. 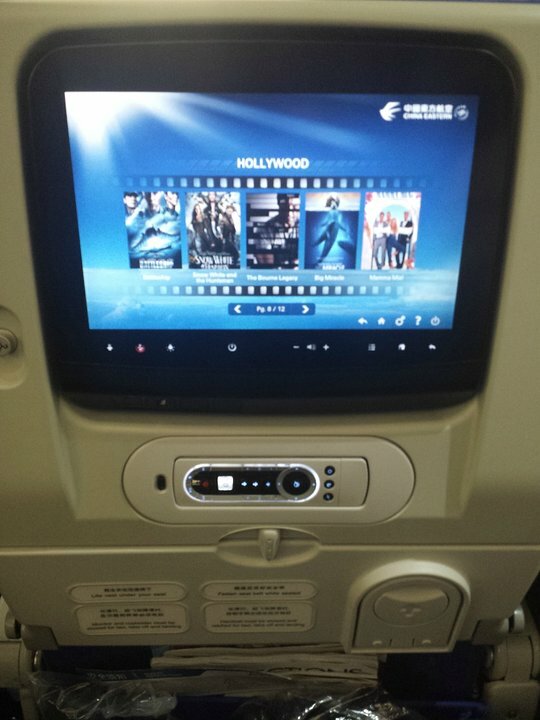 Each Business Class seat has a 15" personal LCD TV and each Economy Class has a 10.6" LCD TV that provides access to various Movies, TV programs, Games (including multiple 3D games), Electronic books, photo browsing using USB, and In-flight browsing and ordering of duty-free goods. This A330-200 is the newest member of China Eastern's widebody twin-jet family. 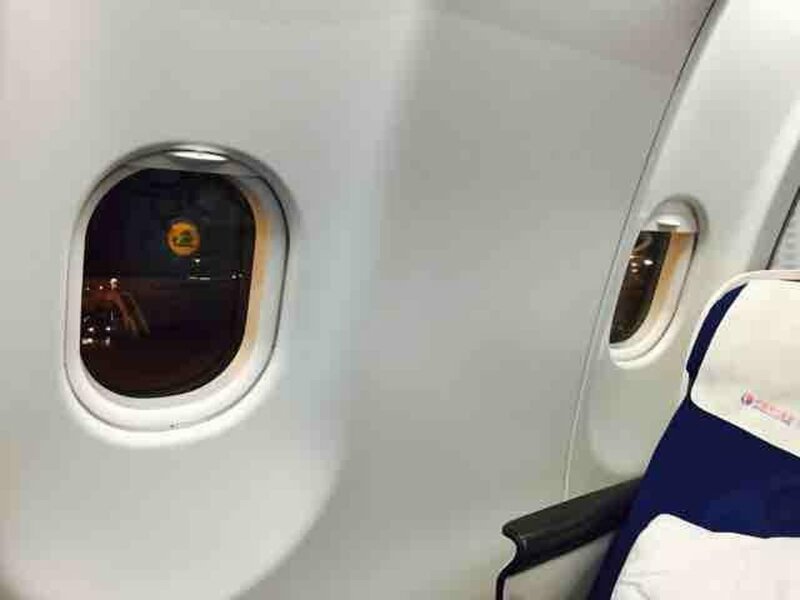 The aircraft seats 234 passengers in a two-class layout with 204 passengers in Economy Class and 30 seats in Business Class. China Eastern operates another version of this aircraft that also flies in a two-class layout with 24 seats in Business Class and 238 seats in Economy Class, for a total seating capacity of 262 seats. While this seat in the last row of the section, there was space to allow a full recline, so that was fine. On this overnight flight, the light stays on near the toilet, so it wasn't completely dark. Also, when people open the toilet door, that light also shines out. So if you cannot sleep with a little light, this seat is not for you. Apart from that, it's just like any other normal seat. Economy seat. Comfort was good for the 12hours. Staff not attentive and food is ok. However, is is better than the Air Canada product. 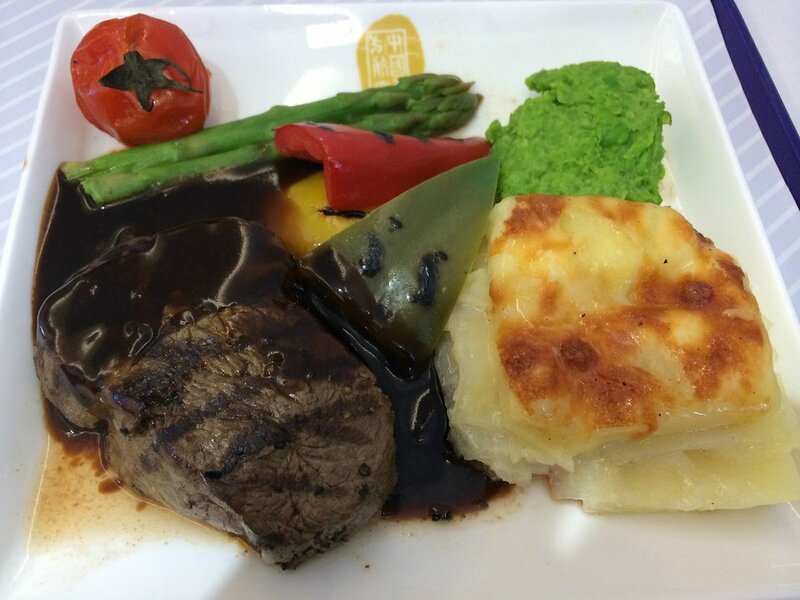 Row 7 is the best row on the aircraft, however row 6 is also excellent, as meal services are from the mid-cabin galley, and there is no forward galley at all, meaning that there is very little activity in the front section of the plane during the flight. The forward lav is a ling way forward, and is unlikey to cause any disturbance to 6A/6C. I took this flight from Paris to Shanghai. 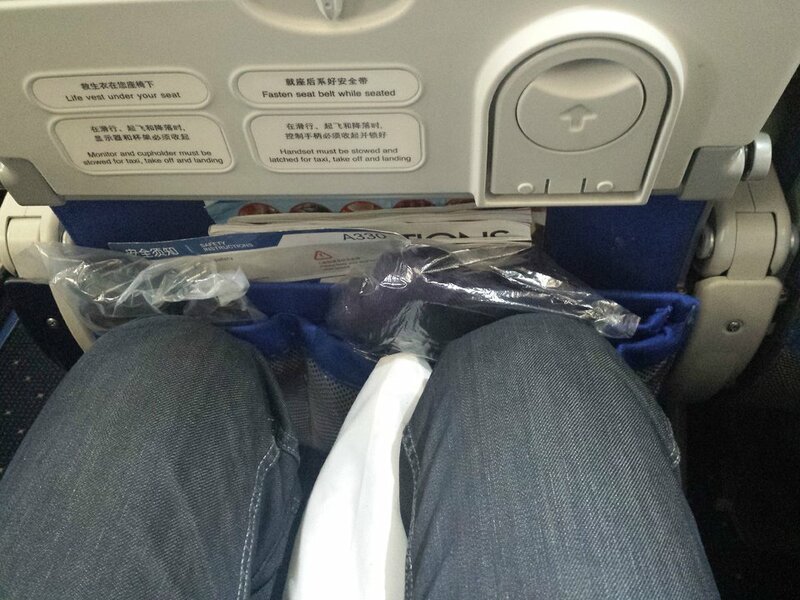 The seat was confortable wnough and the leg space was just enough (I'm 1,85m). The food (2 meals) was fairly good and the atendants were nice and good english speakers. The screen has a good size and is touch type. The selection of movies is fair enough. 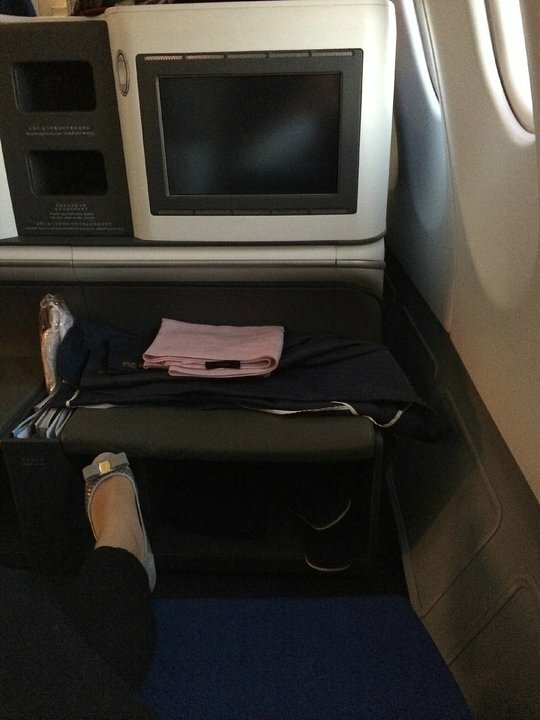 It was a fine flight and was way better than other aircraft flying for China Eastern.It had a Touch screen TV and a USB port.It was OK.You should try seats located in front. Flight was slightly empty so the back few rows were not completely full. The seat next to me was empty allowing me to spread out and be comfy. Lavatory was close but not to close. Food was good. Best part was the inflight Tie Chi. Screen was crisp, good selection of music and things to watch. Full flat bad, comfortable enough for a good sleep. Food tastes awful, though. IFE system is marginally operational due to overall awkward design. The pitch and width have got top level niveau. Full lie flat seats. Just great, nothing to complain.